Rio 2 Movie Party: Activities & Crafts to Celebrate the Fun of Rio 2! I don’t know about you, but our family has been waiting for the new movie Rio 2 to come out since, well, since we fell in love with Linda, Blu, Jewel, and the rest of the crew back in 2011! 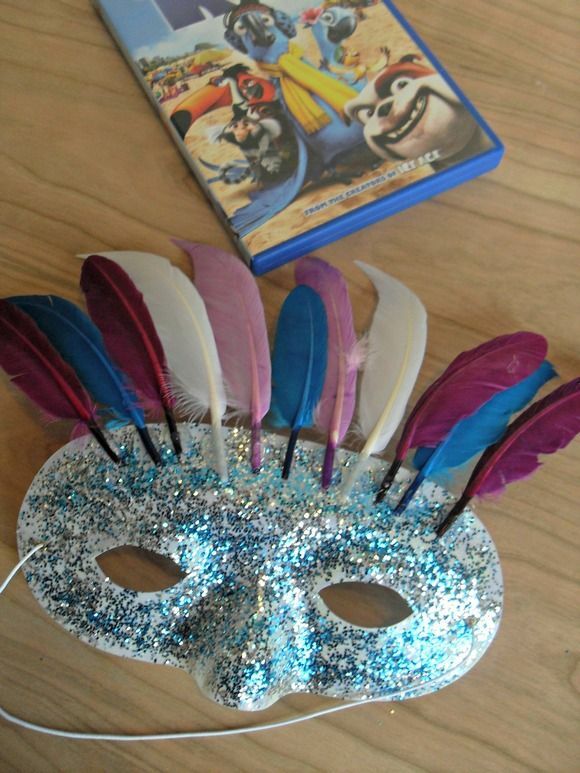 We thought this would be the perfect movie for hosting a Rio 2 Movie Party, complete with crafts and activities! We’ve put together some ideas for a fun night with family and friends as we reunite with our famous feathered friends. 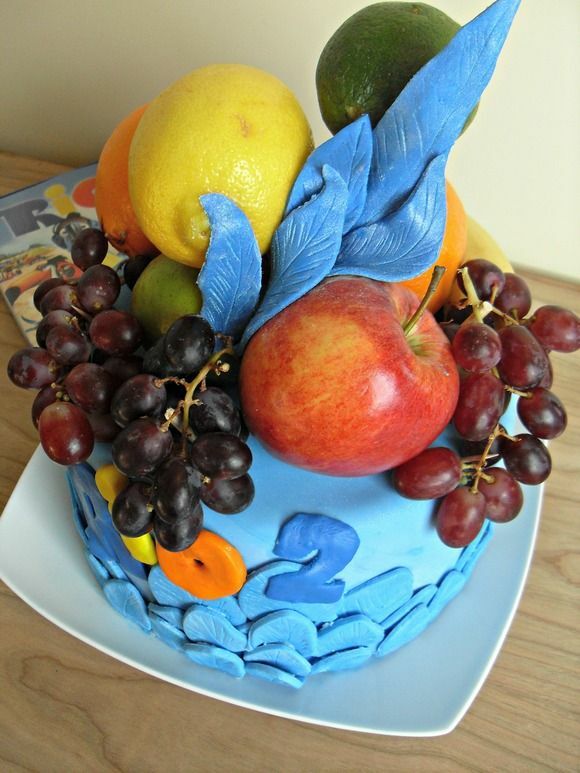 Snacks, games, a craft, and even a Rio 2 themed cake will make this movie party a hit with all! Who doesn’t love snacks during a movie party? We thought a Rio inspired “Popcorn Bar” would be a great idea! Simply make up a large kettle of popcorn and serve with toppings for guests to make their own popcorn trail mix. Some ideas for healthy toppings might be dried fruits such as pineapple, raisins, mango, and banana chips. You could also serve almonds or other nuts, and candy coated chocolates in shades of blue. In keeping with the theme, fresh fruits in vibrant colors would be another great snack option! We’ve also thought of a great craft for the kids to do and enjoy the whole movie. For just a few dollars, you can pick up the supplies and let the kids become part of the cast as they each create a mask to wear throughout the movie. 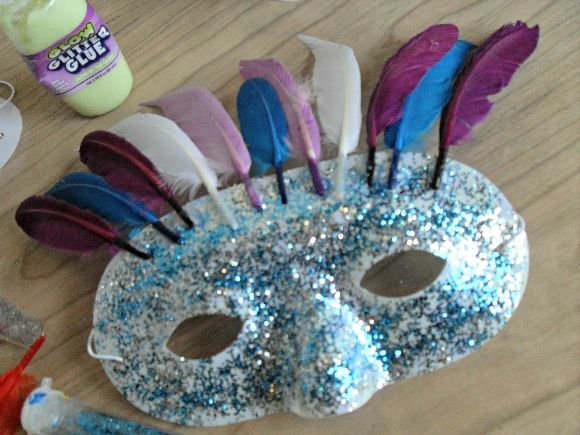 With feathers, glitter, glow in the dark glitter glue, and other supplies, the kids can each create a unique mask to take home from the party. 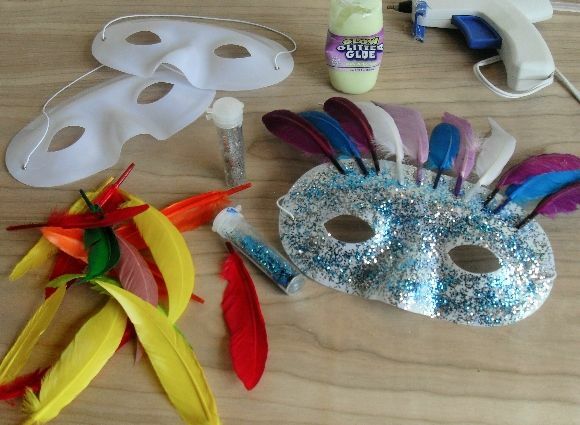 Whether they choose an all feathered option to become one of the birds, or something reminiscent of the masks worn during Carnival in the original Rio, they are sure to have fun with this craft. Get started by having each child cover their mask with a light layer of glow in the dark glitter glue. It doesn’t have to be glow in the dark glue but won’t it be fun to see all those glow in the dark masks when the lights are turned down for the movie? While the glue is still wet, have each child sprinkle their mask with colorful glitter of their choice. While the glue dries, have the kids enjoy a snack or play a game. After the glitter and glue has set, attach feathers and other embellishments with hot glue. Once hot glue is dry and cool, have each guest try on their mask. Make sure to have them pose for a photo! You can have the photo printed after the party and send as a special thank you note for all that attended. Take some time before,during, or after the movie to play a game. Keep it simple and free with a game of charades! Have each guest act out a character from one of the Rio movies while the rest of the gang tries to guess who they are! This could be an ongoing game throughout the night. 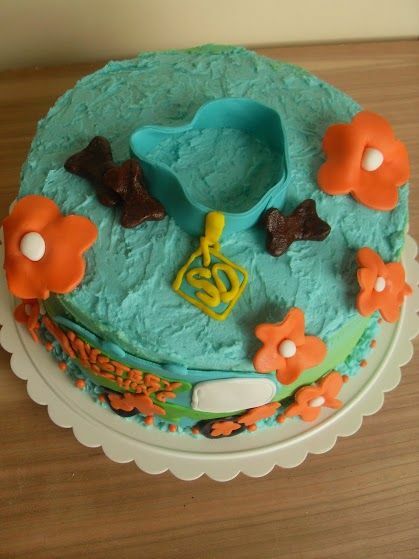 For the evening’s finale, cut into a Rio 2 Movie Party cake! This cake has it all. 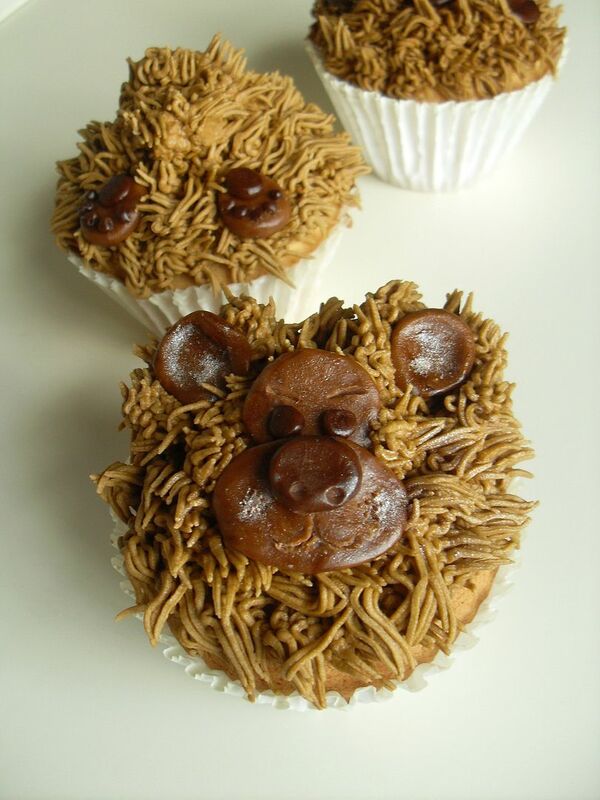 It is not only adorable, it is fairly easy to make by following our tutorial. While it still has plenty of delicious frosting, it’s topped with fresh fruit and the cake itself is an easy, homemade, healthy recipe! 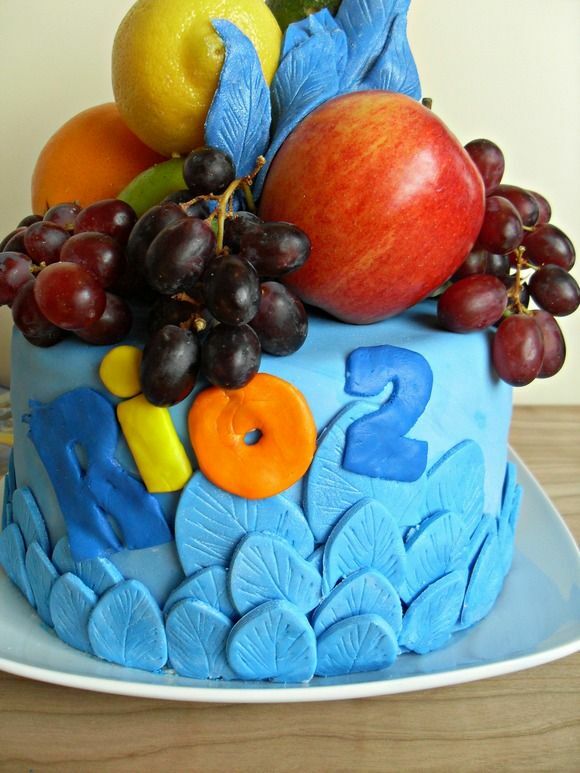 What do you think of this Rio 2 movie party for kids? 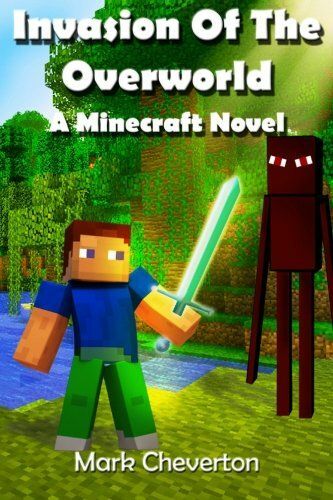 Will you be seeing the movie when it comes out? This looks fun to make and to wear. I like how this will get the kids charged up for the movie and inspires creativity. My son and I will be watching this movie for sure! Rebel Sweetheart recently posted..Foodie Goodie | Chicken Barbecue. What a fun idea to do with the kids! We plan to see RIO 2, so this would be fun to do beforehand to get more excited about it! Looks very cute–but we will probably wait for the DVD–GREAT JOB on the mask. Pam Rote recently posted..#Disney Side “FUN WITH MICKEY” there’s a #giveaway— WINNER! Fun project, got love the glitter. I love your face masks to celebrate Rio 2! My kids are crazy about making/wearing masks. They’ve seen the first Rio movie, but not the second one I think. Jenna Em recently posted..Kinder Canada Hops Into Easter With Great Chocolate & CONTEST! So much fun! When kids love a movie, they just want to be part of it any way they could and this is definitely a good way to get them into it. I think we will! Though I haven’t seen the trailer of the movie, I am quite sure that my kids would love the movie. Great mask! We loved Rio, I’ll be watching for Rio 2 to come out now. Loved the first movie and can’t wait to see the follow up. The masks are perfect for our colorful feather friends. Thanks everyone! I’m so glad you enjoy this idea! It would be fun to get a group of kids together and make these masks before heading to the theater…imagine a theater full of little glow in the dark feathered masks!